Signs were recently replaced at the TCH106 Rotary at Pictou, NS……somehow they missed this one! Sign would have been erected in 1968 when that section of the Trans Canada opened and converted to Metric in 1977…….but its roots are clearly showing! Let’s see your photos of any other pre-metric relics out there. Several other ones around my NS pages, but the first one I thought of when I saw the thread title is the one you posted! Besides the fact that the entire rest of the world besides one superpower and a couple third world countries are using it? And the whole Canadian cultural desire to differentiate herself from the USA? I don't know about that, Corco. Canada's struggle to self-define a cultural identity distinct from that of the USA has led to its being labeled a "nation of assistant professors," but I think Canadian metric conversion has to be seen in the context of a wider push toward metric in the Anglophone world during the 1970's. Canada, New Zealand, and Australia all converted to metric in the 1970's, and planning for metric conversion was well underway in the US and Britain at the same time. Canada had no control over metric conversion in the US. If it had gone forward, instead of stalling after a few localized experiments like I-19, control-city distance signing in Ohio, and dual-units signing in California, the same units system would be in use on both sides of the border and would not be a differentiating feature. Even metric isn't esier than the typical American answer to unit conversion: don't. I've lived in the USA my entire life (vacations in Canada and Europe don't count) and I much prefer metric to the silly gibberish measurements used here. It makes a hell of a lot more sense. Plus I'm that age where when I was a kid starting school it was the time when the USA was supposedly going to be switching over soon, so from kindergarten through about the fourth grade the teachers focused more on teaching us metric units than they did the old-fashioned ones. There was some time spent on the American units, just not very much. I thought there were 12 ounces in a pound until I was in my 20s because so many things are sold in 12-ounce packages (yeah, I didn't realize there are two different units of measure with the same name, one for liquids and one for solids). I find some American objections to metric measurements to be just stupid. My old boss's secretary once said, "How would you be able to tell how fast you're going?" I looked at her and said, with a straight face, "See, there's a speed limit sign that says '100.' You look at the little needle on your dashboard and if it's pointing at '100' you're going the speed limit." I also don't understand how Americans can claim metric is "too confusing." If that's so, shouldn't our money be too confusing to understand? It's decimal as well, after all. I will concede that until your mind adjusts, using degrees Celsius is probably a harder adjustment for most people than weights and distances. Regarding signs, I haven't used the road since 2006, but for many years there was (may still be) a sign just north of the border on Autoroute 15 that said, in French and English, "Our Traffic Signs Are Metric." Then it had a diagram showing a sign on the left that says "Maximum 60/40 Minimum." That sign was crossed out in red and an arrow pointed to another sign on the right that said "Maximum 100/60 Minimum/km/h." (The slashes, except for the one in "km/h," denote where the following text was on another sign.) I always found this sign a bit amusing because if its intent is to help American tourists, it arguably fails because Americans don't have speed limit signs that say "Maximum 60." I thought it would have been more effective if the sign on the left had said "Speed Limit 60." Personally I prefer having a distance measurement system that corresponds to the Public Land Survey System. I don't really care about weights and volumes, but there's absolutely no advantage of Celsius over Fahrenheit, since you can't multiply in a temperature system that's not zeroed on absolute zero. Switching to metric time would be more logical than to Celsius. .... Switching to metric time would be more logical than to Celsius. The French tried that during the Revolution. Didn't work too well. I could get used to that 5-day work week...er, décade. Remembering 360 day names, now that's a bit tricky. 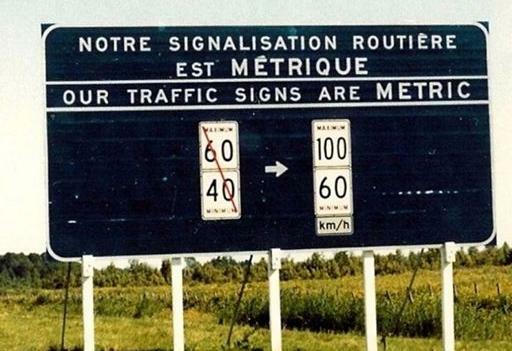 Regarding signs, I haven't used the road since 2006, but for many years there was (may still be) a sign just north of the border on Autoroute 15 that said, in French and English, "Our Traffic Signs Are Metric." Then it had a diagram showing a sign on the left that says "Maximum 60/40 Minimum." That sign was crossed out in red and an arrow pointed to another sign on the right that said "Maximum 100/60 Minimum/km/h." Similar idea, but not bilingual. Handling speed limits and distances in meters and kilometers is quite easy for me, at least insofar as driving is concerned. I can "Thinkmetric", as the old signs said. And liters I understand just as easily as gallons since, after all, we do use them here! Other measures are more difficult. Celsius I usually need to convert to Fahrenheit to really comprehend. Kilograms I need to convert to pounds somewhat. And then of course you have things that are selective comprehension based on application. Say you have a 60 Watt lightbulb and I know exactly what you mean. But say you have a 60 Watt motor and I'll be like "huh, what?". Motor capacities are always measured in horsepower. All things considered, metric is definitely a neater, simpler system to use if you're used to it. But realistically the costs for the US to convert would be astronomical and we don't have the money. That, and Americans are stubborn and we like being different. I can only think of one particular sign in my area that used to tell a distance in imperial units. On "STOP AHEAD" signs, we used to put the distance to the stop inside the red octogon, and I'm pretty sure at least one has been modified from "500" (feet) to "50m"... quite sloppily too. But this really is the only one I can think of. Nova Scotia has a good number of very old signs with remnants of imperial units, though. That sign makes more sense because of the "mph" plaque. Handling speed limits and distances in meters and kilometers is quite easy for me, at least insofar as driving is concerned. I can "Thinkmetric", as the old signs said. [...] Kilograms I need to convert to pounds somewhat. Same here, if we went to cm-km or kg overnight, I would be fine. I think part of this is if you've ever been to a foreign country, and you perform a mental calculation to make sure you aren't being ripped off between your currency and the one you now need to use. After a day or two, you barely think twice about it (if they use a "metric" form of currency, that is; I can only imagine the hijinks of visiting the UK before their currency changes for 1970). Other measures are more difficult. Celsius I usually need to convert to Fahrenheit to really comprehend. I think that one would be the tricky one. Great for methods refrigeration and freezers, but of little helpful difference for anything else. Conversion factor is also really odd. Kelvin is really the only scientific scale (and nobody publicly uses that for discussing ambient temperatures). But say you have a 60 Watt motor and I'll be like "huh, what?". Motor capacities are always measured in horsepower. Interestingly, power ratings are all over the map, literally. but Germany and some parts of Europe and Japan occasionally use the Pferdestärke or PS: which is literally the inverse: 1 PS = 0.986 hp. For all intents and purposes, it's quite close (almost nobody can notice a 5 hp difference, anyhow). Even if we did a massive conversion, I don't think there would be a massive improvement in efficiency with business, government, and industry just because we suddently went metric; if anything, we'd be collectively flummoxed for a year or two. There would be so many holdouts and exceptions granted (sports, traditions, non-profits, as to make things even more annoying). Except 62 mph = 100 km/h. There's a similar speed limit conversion sign on ON 137 north leaving Hill Island. Technically, yes. However, the point of the sign is not to be hypertechnical, but rather to remind the driver which measurements are in use, especially since many Canadian speed limit signs no longer have the supplemental "km/h" reminder underneath. Conversions of speed limits are not normally hard conversions where you switch to the exact number (though there used to be a sign on I-87 just south of the border that showed 105 km/h switching to 65 mph). Rather, a speed limit of 60 mph or 65 mph usually switches to 100 km/h even though it's not an exact conversion; 65 might also switch to 110. Speed limits aren't normally posted in increments of anything other than 5 mph in the USA, and in Canada the only times I can recall seeing 5 km/h gradients were on yellow advisory speed signs. Even the MUTCD edition that used metric as the primary system of measurement used soft conversions, as I distinctly recall it referring to 100 km/h and then saying "65 mph" in parentheses. So anyway, as a practical matter, the sign is accurate from the standpoint that they're saying a 60-mph speed limit changes to a 100 km/h speed limit. Point is, I understand what you're saying and I concede your accuracy, but I think the level of precision you're referring to isn't necessarily beneficial on a road sign that's intended as purely informational. A distance sign ought to be either converted more precisely or, if round units are preferred, relocated to ensure the right distance, but the intent of a distance sign is very different from a sign of the particular sort at issue here. Been a long time since I went northbound that way—only been southbound recently. The sign I remember there from family vacations when I was a kid said "Canada has gone metric!" (with the exclamation point) and I don't remember what the speed limit information underneath looked like. I seem to recall a US-style speed limit sign on the left and it then said "changes to" with a Canadian-style sign on the right. I have no clue what the numbers were. I understand why in Quebec they'd use a different scheme due to the language issue. The ferry terminal in Yarmouth didn't have any sort of advisory sign and I just don't remember as to any of the other border crossings I've used because I wasn't paying attention. Edited to add: Alps Roads has a picture of the Autoroute 15 sign I recall being there as recently as a trip to Mont-Tremblant in January 2006. I understand he doesn't like people to embed his images elsewhere, so I've simply linked the page. BTW, I agree with him about liking their four-way stop indication. Edited to add: They removed bandwidth limitations, so go ahead. Photo by Averill Hecht ( alhecht at comcast.net ) who asked that he receive credit. It is actually not that difficult. 4 farthings to a penny, 12 pennies to a shilling, 20 shillings to the pound. Things ceased to be priced in farthings several decades before decimalization, so the system had been simplified even further. In practice only fairly major purchases were priced out in full in pounds, shillings, and pence. Most other things, like groceries and paperback books, were priced just in shillings and pence (often separated with a slash and a hyphen for whole shilling amounts: e.g., 5/-). The pound was not really pocket money until after inflation in the 1960's and 1970's. To give an idea of how valuable the pound was, in the 1930's £500 was a typical price for a house. I also don't think £1 was the lowest denomination of paper currency until relatively late (I believe five-shilling and ten-shilling banknotes were issued at various points in the pre-decimalization period). The real difficulty came immediately after decimalization, when pre-decimal currency was still in circulation and people had to memorize "old money" and "new money" conversion factors until it was withdrawn from circulation (I think it has since been demonetized). As an example, two old sixpence coins would have been worth five "new pence" (two sixpence = 1 shilling = 1/20 of £1 = 5p). Occasionally, in works of popular history, you will see people do these conversions in order to make pre-decimal money amounts accessible to readers who were not born in 1970. I did not do this in my own graduate thesis, and instead quoted amounts in £ s. d., Reichsmarks, and pre-World War II Italian lire as they were given in the original sources, but whenever I needed to give an impression of how large an amount was compared to other prospective uses of the money, I mentioned things like the cost of milk for schoolchildren, the cost of a "corporation" house, etc. In the US metric units on signs are not even on the table. The real battle, which has been raging since the mid-1990's and has now been settled decisively in favor of English units, is metrication of highway design and construction. Many highway engineers would far prefer to work in metric because units for things like stress and strain are dimensionally correct, unlike the English-unit equivalents. However, the contracting community has resisted metrication because it is costly to change out standardized components like sewer pipe and day laborers have little vernacular knowledge of metric. Indeed, you'd only really have worked in two units (pounds and shillings for the rich, for whom the pennies didn't matter, and shillings and pence for everyone else). Even in '58, when my Grandparent's bought their house (now worth something like £180k, if not more), either their mortgage, or their full house price was £600. Half a penny was also a decimal coin until the mid-80s (and was worth the equivalent of 2p in today's money), despite the penny changing at decimalisation (with 12d becoming 5p). The ten-bob note remained until decimalisation, IIRC. I think those who said that decimal money would be too complex had a point - yes, it's easier to use, but there was a horrendous change that went better than could be expected, some serious price inflation in the conversion (also happened in many Eurozone countries when they switched) - for instance I have a late 60s map of Jersey with a decimal price overlaid over the s/d price (6/6 became 55p, when that would be 32.5p in a direct conversion - inflation in the early 70s couldn't have been high enough to cause a 40% mark up in a couple of years). You could have simply had 1/2, 1/4 and 1/8 shillings, and ditch £sd notation for £s. You'd lose the eighth-shilling coin after about 15 years, quarter-shilling after 20ish, half-shilling after 30ish. That's exactly the reason—the old NMSL prohibited a state from posting any speed limit higher than 55 mph on pain of losing federal highway funds, so they didn't dare post anything above 88 km/h. I think I read somewhere that there were a few such signs on the New York Thruway near Syracuse. I never saw them so I don't know for sure. In point of fact, 88 km/h represents a very slight speed limit cut from 55 MPH because the conversion factor is not 1.6 km/h = 1 MPH exactly (it is more like 1.6093). 55 MPH is 88.515 km/h. Arizona DOT could have posted 88 km/h signs on I-19 (as originally planned in 1981) without running foul of the NMSL, and even for speed maniacs a cut of half a kilometer per hour is too little to fuss about. So the mystery of why the 88 km/h signs were either not posted at all, or posted and then taken down, remains unsolved. While I suppose it's helpful to remind drivers that the units are changing (though I personally could not imagine absent-mindedly driving down some Canadian side street and thinking the speed limit was 50 mph... I mean, the signs look different! ), showing conversions is kinda unnecessary since all speedometers in US cars have km/h on them, anyway.